Even if all you have is a wah pedal, compression pedal, and delay pedal, you could be easily looking at a minimum of $400 in guitar effects pedals. And you don’t really want that just bouncing around on some homemade board. A pedalboard allows you to protect your pedals, makes traveling between gigs easier, shortens the setup time, and guarantees that your pedals are always where your foot expects them to be. Plus, a good pedalboard makes it easier to add new guitar pedals. And we always know that you are already shopping for your next one. Click Here to shop pedal boards on Amazon. 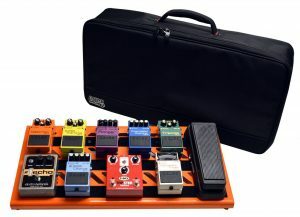 The traditional pedalboard is simply a frame with velcro for attaching the stompboxes. The velcro makes it easy to re-arrange the order of your pedals to get the desired signal chain. A classic layout would be guitar, then compressor, followed by the volume pedal and a Wah pedal. More advanced setups will also run it through an overdrive and chorus pedal with an optional reverb before sending it to the amplifier. Adding new guitar effects become simple. Even if you are just borrowing one for a single gig. Most artists don’t invest in a pedalboard until they have more than three stompboxes. When you get more than four or five, it becomes cumbersome to carry everything. I’m one of those organized freaks who bought a pedalboard right away. Furthermore, a high-quality board is going to have a lot of extra features on it that simply make it more fun to play. You can get locking jacks to keep each individual unit from constantly becoming unplugged every time you wiggle, bump or move your gear. You can get boards with built-in power supplies that make them compact and cleaner. It also is a much more professional look. You show up to a gig and you aren’t fighting with haphazard pedals and cords. All of your pedals still work because they are securely plugged in and protected by a hard shell case. One of the big challenges when comparison shopping is that you have to make sure your gear will fit on it. Pay attention to the measurements. I’ve even seen some folks swap out a couple of micro pedals in order to get a better fit for their entire kit. Unless you’ve been playing for a long time, you will also want to buy a larger setup than you currently need. I know that seems like a waste, but as time goes on, you will want to add more pieces and if you don’t have a large enough board, you’ll be back here shopping in a year. Also, spend more on a kit that offers a hardshell case. I know that can seem like an unnecessary expense if you are mostly playing at home — especially when it adds 2x or 3x to the price of the board — but with the investment you have already made in your pedals, it only makes sense. Finally, think about what features mean the most to you and what you would enjoy spending more money to have. Do you really like an angled board? How about handles? How important is a built-in power? Deciding on some of these things now will ensure that you love the entire setup you spend your hard-earned cash on. As I researched this article, I was looking for the pedalboard kit that was the most professional. Something that you could purchase right now and continue to gig with it when you were a millionaire. And then, to complement it, I wanted a top pick that would be great for the artists who are playing in the coffee shop. It’s tough to compare this one and the Pedaltrain Pro. 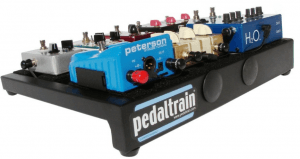 The Pedaltrain Pro that I review below offer an underside mount for the power supply. That setup has the advantage of a cleaner setup. By hiding the power supply out of the way, the Pedaltrain Pro saves critical board space. With the Gator G-Tour, you have to save a spot on your pedalboard for your power adapter module. Where this wins is in the professional quality build. The board itself is a solid piece of plywood surrounded by a full aluminum valance. This gives you an extremely stable surface for your pedals, and the low profile keeps your kit out of site. The flat layout is also a top pick for singers and keyboardists. Guitarists who make frequent changes may prefer the Pedaltrain PRO that we discuss in a minute. Then, the entire kit fits inside a hefty pedal board case. This road worthy case is one of the most protective options on this list. It uses an EVA foam interior for added shock protection, and the large pedalboard (and X-large) both come with wheels, making it easy to get from gig to gig even when carrying a guitar. This one also comes with a higher-quality Velcro-type fastening system for your effect pedals. The 3M Dual Lock strips hold the pedals more tightly than most of the other kits. Granted, if this a feature that you want, you can always buy these strips separately. This is the most professional kit in my lineup, although the Pedaltrain PRO tries to come close. This isn’t really the second-ranked board. It is an excellent choice and is going to be much preferred by guitarists who want to make frequent changes to their effects pedals while they are playing. Since we first wrote this review were complained about how heavy this pedal board could be, Pedaltrain has remade it with lighter metals. It’s now 35% lighter than the original and the best pedal board for professional artists. The case is very sturdy and spacious with a generously padded foam interior for added protection to the contents. It comes with wheels and a retractable handle. 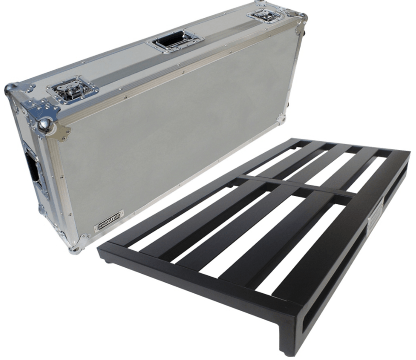 The aluminum pedal board is lightweight at about 7 lbs and easy to handle. The case weighs in at 32 lbs and measures 39x19x9 inches. It also includes a padded compartment for extra storage. If you don’t want to deal with or simply don’t have need of the large flight ready case, you also have the option to order this setup with a soft case that weighs only about 10 lbs. The soft case is made of durable Cordura nylon and contains sturdy panels on the interior walls for added protection and strength. It also includes an ample pouch on the outside for added storage. The frame is constructed of welded tubing to be as strong and sturdy as possible with no moving parts that could possibly break or wear out with use. The open frame design and elevated angle allow you, the artist, with plenty of flexibility when it comes to deciding on the layout of your pedals and effects. In order to minimize the possibility of accidentally disconnecting cables, they can be routed under, over and/or through the open slotted top surface area. There is also space provided underneath for additional power strips and supplies. It comes with the needed supplies – zip ties, Velcro, brackets, etc – for mounting your pedals. Most guitarists also add a power supply (purchased separately) to create a professional-level powered pedalboard. Instructions are included to guide you through the mounting process once you are ready to add the power upgrade supply unit. (Voodoo Lab power is one of the most popular ones). If you are reading a review and Gator is not near the top, then you should be suspicious of that reviewer. In this case, I double-stacked them. I’m being slightly sarcastic, of course, but when it comes to a professional pedalboard, it is hard to find a better setup. This one is lightweight, comes in multiple colors and multiple sizes. Gator GPB-BAK is made from lightweight aluminum that makes it durable for nightly gigging while still being easy to carry. The different color options allow you to choose a style the best reflects your sense of fashion and gives you that added personalization. The entire board has a slight angle to it, tilting your pedals towards you with the perfect access for quick effect changes. At first glance, this pedalboard is one of the simpler ones. Its genius is in its simplicity. 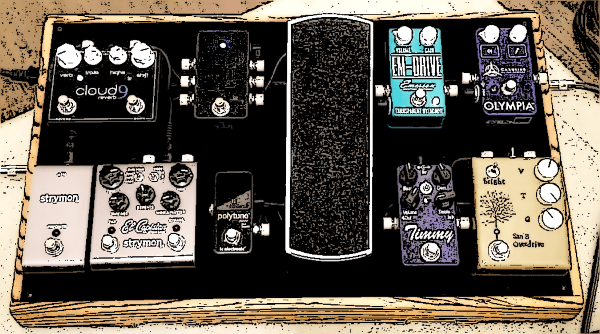 Function over form with understated style was the policy when they designed this pedalboard. You’ll notice that it has holes running at a slant. These holes are perfectly spaced for the wires to run through. The angles push cords to naturally align with the top or the bottom of the board, creating a cleaner look as you run daisy chain power and patch cables around the board. It comes with three large pieces of velcro that affix to the board. Smaller pieces of velcro that you cut to size will hold each pedal to the board. The Gator GPB-BAK comes with universal mounting brackets underneath the main panel, which allows you to mount just about any type of power unit with ease. The finish of this particular one is bright orange, although it comes in several different colors. The pedalboard comes with a soft case. This is what most of the users will name as its biggest issue. Compared to something like Pedaltrain Pro, which comes with a hard shell case, Gator GPB-BAK’s gig bag offers limited protection at best. With that said, you will definitely want to take care of not to bang the bag somewhere as you travel. 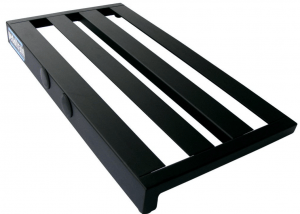 Its very simple design makes this pedalboard fast to set up and easy to use. The bright colors are eye-catching and make it easy to find your board even in dimly lit environments. 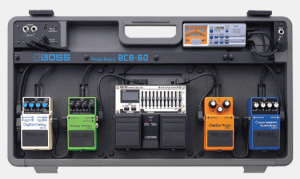 This pedalboard measures 23.75″ x 10.66″. That’s about enough for some 12 regulars pedals or 9 larger ones. Gator GPB-BAK is a mid-range solution that offers the most versatility in a very simple design. It looks and performs great no matter what your intended application is. You will need to be extra careful with the case while you travel, but unless you are constantly touring, the soft gig bag shouldn’t be a problem. If you need a strong getup that won’t ruin your bank account, this is one of the best options. This is one of the best compact pedal boards. If I was starting out and needed to cover a lot of ground, I think this is the one I would settle on. It’s going to fly nicely, fit smoothly in the trunk of your car and store in your apartment closet. It’s the perfect choice for the artist who has their pedals dialed in, knows exactly what they need, and values a small form factor. This a powered pedalboard with a built-in 9VDC adapter that provides enough power for up to 7 pedals. This 1,000mA adapter keeps you from having to buy an additional supply and also helps with the slimline appearance of this system. It also comes with the necessary cables which make this unit one of the most plug-and-play options available. The padded interior keeps your equipment safe and secure while you travel, while the hard plastic exterior protects from punctures and pressure. The molded handle makes it easy to carry, even if when are racing from one end of the Dallas Fort Worth airport to the other. When it is time to gig, you slide two levers, open it up and pop the top off. Plug in your amp, plug in your board and plug in your guitar. It is simple, fast, and effective. Because Boss makes their own pedals, they obviously want to push you to use their pedals. However, any major pedal or multi-effects board should fit in just fine. This board is just over 27 inches wide and 14 inches tall. Then it comes with an ample, nearly 4 inches of depth. This board lacks the protection of a flight case. 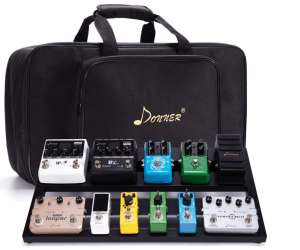 However, if you are looking for the best cheap pedalboard and you want more protection than a soft-sided gig bag will offer, then this is one of the best options. Both the PT-2 and its accompanying hard case are strong, durable and rugged pieces of equipment. Although you do have the option to purchase a soft case, the hard shell really is worth the slightly higher expense. Flight ready and spacious, the case is well lined with foam to add protection as well as keep items stored inside from slipping and sliding around. 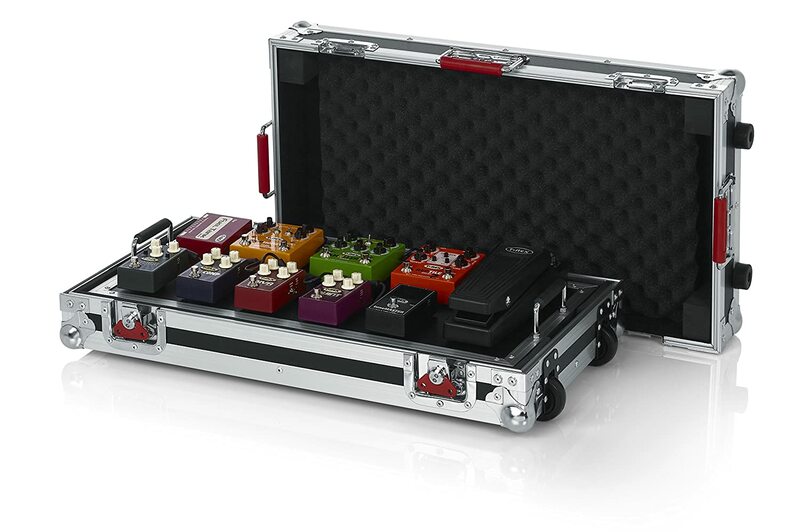 This case also provides room for carrying around extra supplies such as cables, strings, straps and other small pieces with your kit and pedals. It closes securely with multiple places to latch and lock giving you a great sense of security when carrying around your valuable equipment. The real star in this setup is, of course, the board itself. Lightweight and constructed of aluminum, this model is as spacious as the SKB, but overall has a significantly smaller footprint. This is due to the fact that it is designed to mount your power supply underneath and out of your way. It also comes with cable ties and velcro for quick and easy power supply installation. Also included is a bracket made specifically for mounting the VooDoo Labs power supply which can be purchased separately if you want it and is super easy to install. You can also easily purchase and attach a universal bracket for mounting a power unit from any other supplier of your choosing. The board is set at a slight incline to allow you easy access to any of your pedals, even those on the top row. You also have the cable runner option to run all of your cables underneath, eliminating the usual mess and keeping your cables from tangling. The provided velcro allows your pedals to be attached securely. With this choice, you can create your ideal pedal layout in a neat and well-organized fashion to suit your every musical and performance need. As the name indicates, the Pedaltrain Jr offers the same durability and great design as it’s big brother, simply in a smaller size. This size is perfect for those wanting a smaller setup and who don’t plan to need quite so many pedals as would fit on the larger sized boards. Like the PT Pro, the Jr is made of lightweight aluminum alloy tubing and is sturdy with no moving parts to wear out with use over time. The PT Jr has the same elevated angle design as well as the open frame as the other Pedaltrains, giving you great flexibility in determining your optimal pedal layout. The PT Jr also comes with hardware for conveniently and easily mounting a separately purchased power supply underneath. The open frame gives you the ability to choose the optimal routing of your cables- under, over or through- to avoid, as much as possible, accidental disconnections during use. Your pedals are easily and securely attached by hook and loop material that is adhesive backed and industrial grade. The large, solid, heavy duty case comes with sturdy latches. It is well padded on the inside with medium to high-density foam on the sides and bottom and softer foam fingers on the top. The interior is spacious providing some extra room for carrying around additional cables and smaller accessories when packed up. Although the hard case is highly recommended, a soft case is also optional. This is a great piece, especially for anyone who does not need super heavy duty protection for large amounts of travel. It can hold up to about 8 pedals depending on their size or a variety of other accessories such as power strips, etc. This case/gear combo comes with hook and loop tape for keeping everything in place. The lid attaches to the base with two latches, both of which come with lock and key. The size of this piece is perfect for a carry on as it meets flight size requirements. Made of aluminum and lightweight for easy transport, though the overall weight and ease with which you will be able to carry it around depend entirely on what and how many pedals and accessories you choose to load it down with. This case also featured steel reinforcement on the edges to prevent denting. Overall this case is very affordable and the best quality of its kind that you will find within this price range. The Donner is a fun little setup. At only 20 inches wide, it is surprisingly compact, even if you purchase the large version that has enough room for two rows of effects pedals. Made of Aluminum, it is lightweight and ideal for playing both at home and out with friends. You’ll notice that it looks much like Pedaltrain. 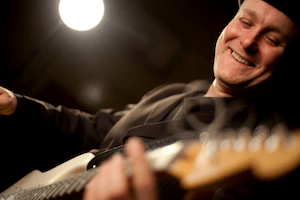 However, the Donner seems to have a bigger following among guitar players who are more on the casual side than those who would consider themselves on the road to becoming “guitarists”. There is an option you can purchase that includes a soft-sided carry bag to make it easier to move from event to event. As with the others, the Donner has ample room to mount your hoop and loop attachments and to connect your power source on the underside of the board. While the Boss BCB I reviewed above, this one is an excellent yet cheap, option. However, it lacks some of the portability that I like with the BCB-60.